Root vegetables get a bad rap. Last year I volunteered for a food bank and we handed out bags of groceries and recipes that featured root vegetables, but I don't think the recipients were excited about some of the vegetables. They were grateful for the food, but the turnips, not so much. However, root vegetables are really good for you and they are packed with vitamins, minerals and fiber and they're inexpensive too. 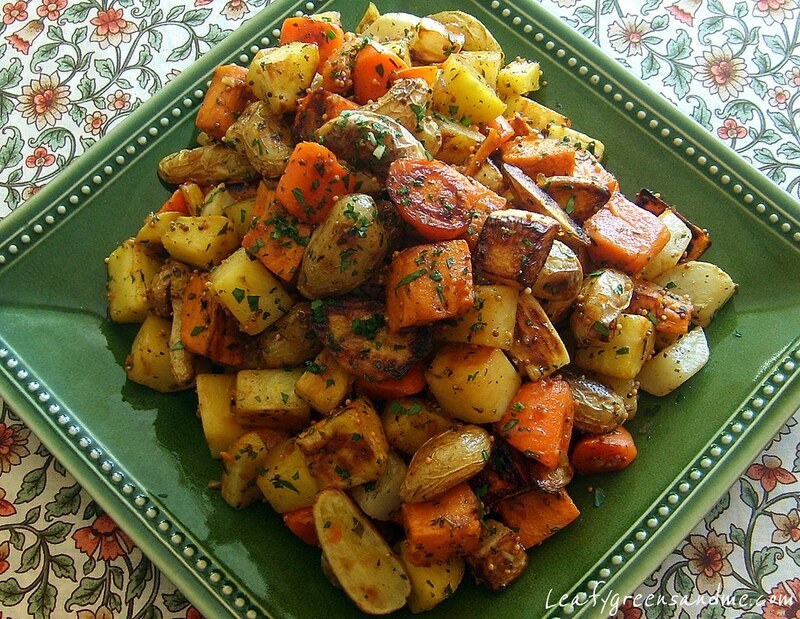 My favorite way to serve root vegetables is to roast them with a little olive oil, fresh thyme and salt and pepper. Roasting enhances their natural sweetness and even mellows the sharp flavors of a turnip. Root vegetables can also be used in soups/stews, pureed and used in place of mashed potatoes, or roasted and used in your favorite burrito or taco. For this recipe, I roasted them and tossed them with a whole grain mustard-sherry vinaigrette, which works well with the sweetness of the vegetables. This is also a great side dish to serve at Thanksgiving--perfect for autumn. Peel and dice vegetables (including sweet potato) about the same size (2" dice) so that they cook evenly. Place in a bowl and toss with with 2 tbsp extra virgin olive oil, 1 tbsp thyme and salt and pepper to taste. Spread out on two sheet trays and roast for about 15 minutes until tender and caramelized. Toss once half way through the cooking process. Roast the fingerling potatoes separately because they take longer to cook. Place in a bowl and toss with 1 tbsp extra virgin olive oil, 1 tbsp fresh thyme and salt and pepper to taste. Spread out on a sheet tray and roast in the oven for 20 minutes until tender and golden brown, tossing once half way through the cooking process. While the vegetables are roasting, prepare the vinaigrette. Add 1 tbsp extra virgin olive oil to a small saute pan and heat on medium. Add mustard seeds and cook for about a minute until they start to pop. Immediately add sherry vinegar, shallot, garlic, thyme, mustard and agave and stir to combine. Simmer vinegar mixture on medium-low heat until reduced by half and is thick and bubbly. Remove from heat and whisk in 3 tbsp extra virgin olive oil and salt and pepper to taste. Set aside and keep warm--you should have about 1/2 cup of warm vinaigrette. As soon as the vegetables/potatoes are finished roasting, remove from the oven and place in a large bowl. Toss with warm vinaigrette, 1 tbsp minced parsley and salt and pepper to taste. Serve immediately and garnish with more parsley. does the sherry vinegar need to be super fancy status? I always use fresh thyme in my recipes. I would only use dried thyme in a recipe that would braise or cook for a long period of time such as soups or stews. So I would not recommended it for this recipe. Yes, you can use an inexpensive sherry vinegar. I just prefer the flavor of the brand I recommended and it's what I used to use when I worked at the restaurant.